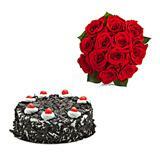 This heartwarming hamper of red roses and Chocolate Truffle cake will surely win the heart of your sweetheart in all cities in India when you send it as Gifts across India through GiftsAcrossIndia.com. 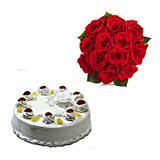 Let your passion speak through this exclusive collection of 12 red roses. 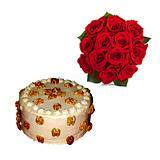 This is the most effective way to express your ardent love and affection for your loved one. 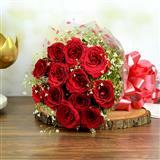 As flowers speaks more than words, this bunch of alluring roses will surely vent your heart-felt emotions. 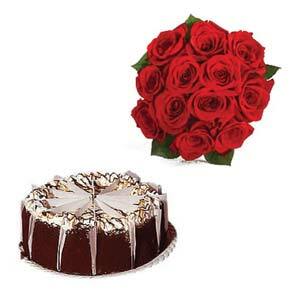 Along with the roses, let your loved one get crazy with the irresistible taste of chocolates. This cake is made of several layers of rich and dark chocolate and topped with rich chocolate sauce. 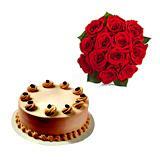 Please your special one with a treat that they shall savor and cherish for a very long time. Please Note : Kindly mention the occasion date in the Special Instruction field when you are placing the order. The date of the delivery should be one day prior to the occasion date. For example: If the occasion is on 25th of the month, in the Special Instruction mention the occasion date and select the Date of Delivery as 24th.